We have been doing a bit of nesting around here, my husband included. All of a sudden our garage is insulated and will be sheet-rocked before long! While I was on bed rest I made up great to do lists from the couch and am now set on a mission to accomplish everything. Of course I feel like I have to do it in one weeks time! Although I am not very crafty you may find me posting a bit more DIY than the usual next to nothing. First up is this beautiful little wall mount coat rack that I absolutely adore. Our entry way from the garage is a tight space, so I am not able to do a preferred set up of cubbies and coat hooks without knocking everything off as you walk by. 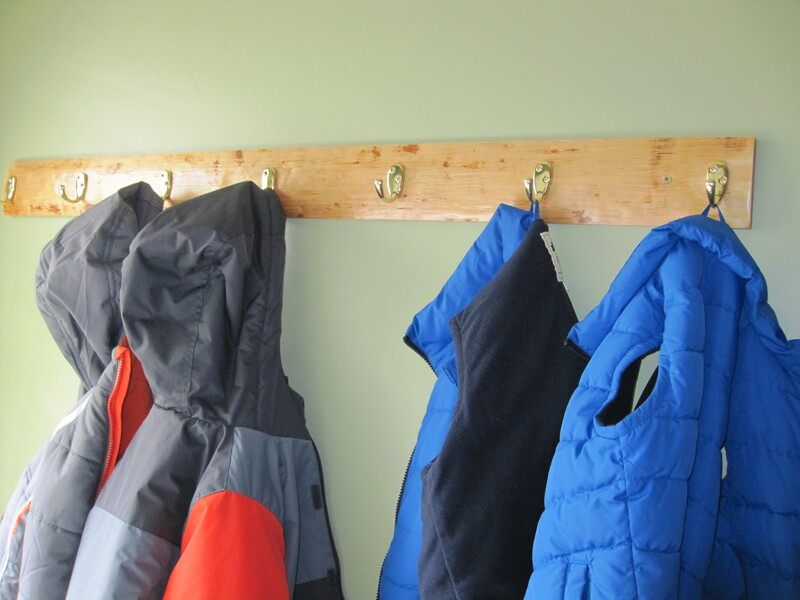 So we had to opt for an alternative and came up with this home made coat rack. Directly in front of the entry way is our laundry room, which is where we opted to hang this. Although, after the way it turned out I would prefer it to be in a room where I could look at it daily. We found this piece of wood in the scrap pile at the lumber yard and picked it up because we both loved the natural character it had. It then went on to sit in our garage for 8 months and now is finally making it’s debut, looking rather refined with a bit of bling. 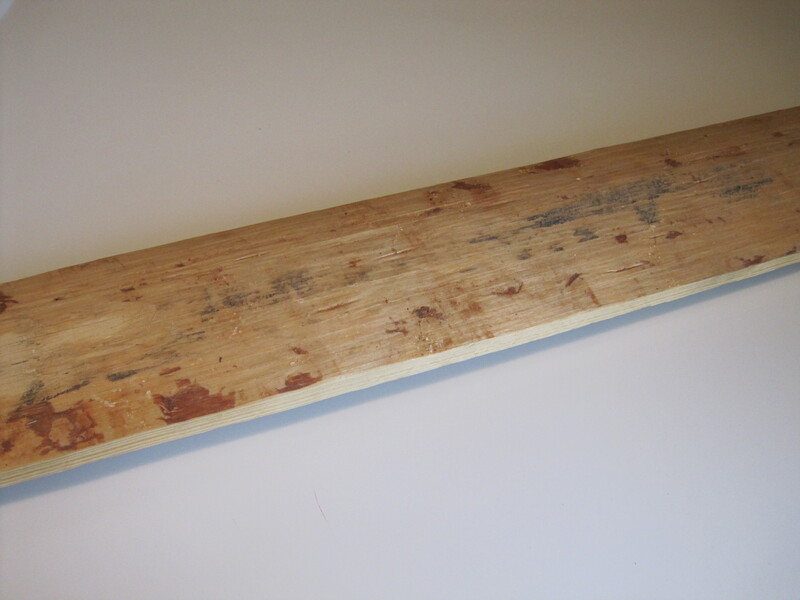 Not much was needed to get this piece of wood ready as we wanted to keep the rustic look it had. Aaron sanded it down a bit so it wouldn’t become a hazard to little children’s hands and then applied one coat of polyurethane. 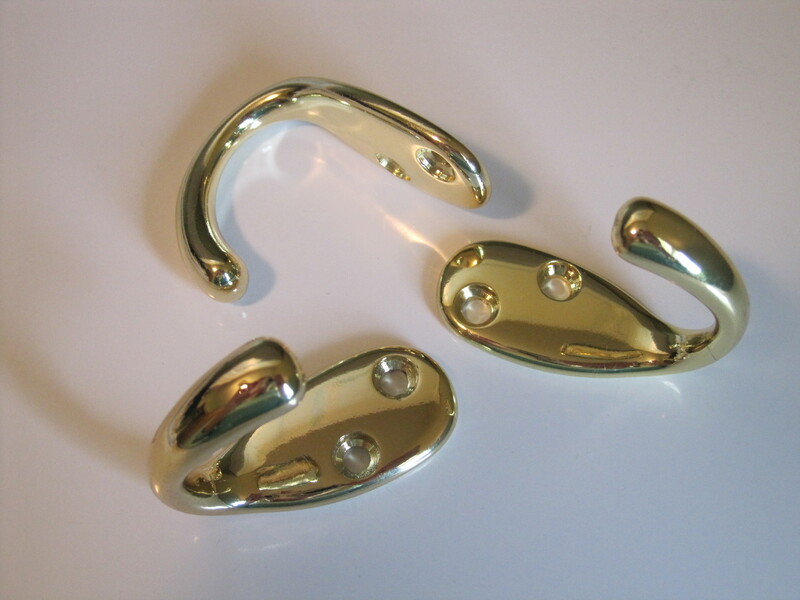 He screwed on these nifty gold hooks and makeover complete! With the updated look the coat rack gives I feel a slight itching to perhaps repaint the laundry room! your way to funny. I did something similar. I did repaint our laundry room and my dear husband(dh) and son removed the laundry tubs for the paint job and then put up a nice back splash to protect the new paint job. Then after all that I ordered these really fun rub on laundry room borders that have pictures of clothes blowing in the breeze on clothes lines with cute little birds flying about the clothes. Many years ago in our first home I think it got started with wanting a new bed spread and before we knew it we had new carpet and window treatments and a paint job. It sometimes just snow balls. Haha…this is great and makes me feel so much better!